The 88-floor building was completed in 1997 and remained the highest building in the world until 2004 with 452m. The Kuala Lumpur Center includes not only the famous twin towers, but also a shopping mall (Suria KLCC), a movie theatre, the new aquarium (KLCC Aquaria) and a park. From Pavilion Shopping Mall there is new a pedestrian bridge all the way to the KLCC Convention Center entrance. At the entrance take the escalator down to Aquaria KLCC. From here you have to option to take the undergound tunnel to Suria KLCC or go up again and walk through the park. 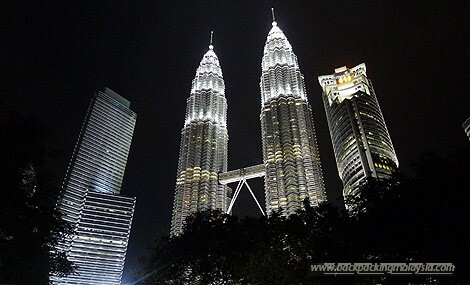 The Petronas Twin Towers are undoubtedly the landmark of Kuala Lumpur. They can be seen (along with the KL Tower) from almost anywhere in the city. 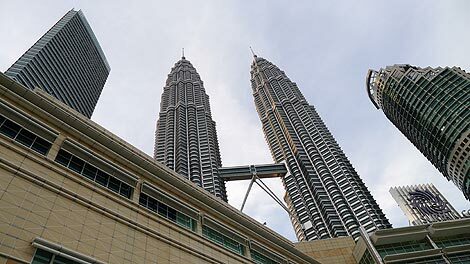 The towers are part of the KLCC complex, short for Kuala Lumpur City Center. The complex was built in 1994-1998 on the grounds of the old horse race track. A whole new (affluent) city district was thus created. Even today, many new luxury Condonimums are being built in the immediate vicinity, because the label "KLCC view" is a good selling point. Until recently it was only possible as a visitor to reach the sky bridge at 41st floor. However it was free and limited to a few hundred tickets a day. Meanwhile there is also the possibility to go to the observation deck on the 86th Floor. However, ticket prices at RM80 for foreign tourists are quite steep. Malaysian citizen only pay RM25. 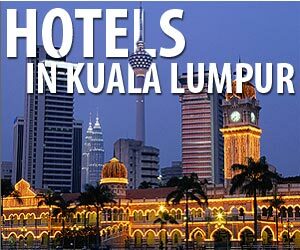 This not very hospitable price policy can also be found at other public attractions in Kuala Lumpur like the Bird Park, or at the KL Tower. Tickets are still limited to 800 persons a day and spread over 20 time slots, so you should get there early. The tickets will be issued starting at 8.30am for the time slots between 9am and 8pm, depending on availability. Part of the KLCC complex is the Suria KLCC shopping mall consisting of 5 floors of mostly expensive brand boutiques and many restaurants. Especially the food court on the 2nd floor is recommended. In the 3rd floor houses a TGV cinema, and the 4th floor the largest bookstore in Kuala Lumpur (Kinakurnya). The interactive technology exhibition / museum "Petrosains" by Petronas on the 4th floor is also recommended especially for children. 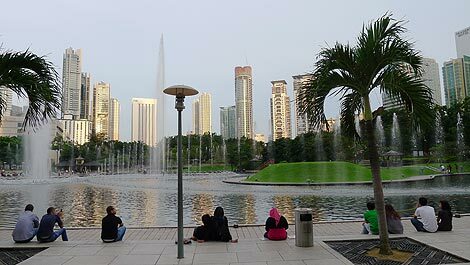 A special attraction for locals and tourists alike is the beautifully landscaped KLCC Park at the foot of the Twin Towers. 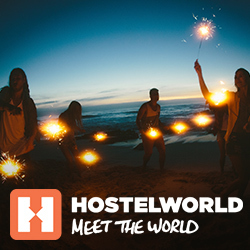 It is also a popular romantic meeting place for couples. The contrast of green park and the modern architecture of adjacent skyscrapers are great for taking pictures. For children, there is a huge playground and a wading pool to cool off. The adjoining KLCC Convention Center hosts many fairs, conventions and events throughout the year. Here at Lower Ground Level you can also find the KLCC Aquaria, a state-of-the-art oceanarium. There is even the possibility to dive with sharks here. From the entrance of KLCC Conventions Center (just above the KLCC Aquaria) there is a covered and air-conditioned pedestrian bridge to the Pavilion Shopping Mall in Bukit Bintang. Thus, using the the underground tunnel between Suria KLCC and the convention center and then using the pedestrian bridge you can make it from Suria KLCC to Pavilion Shopping Mall (ca. 2km) without being exposed to rain or heat. The Petronas Twin Towers / KLCC are definitely a must for any visit to Kuala Lumpur. They should be visited during the day so well after dark. In particular, the lighting at night (the lights will be turned off at midnight) is very impressive. If you want to enjoy a special view of the park and the towers from the top, it is recommended to pay a visit to the Sky Bar at Traders Hotel, right opposite the Towers on the other side of the park. Menara KL or KL Tower, with a height of 421m, is the 7th tallest tower in the world. As it is built on hill, the observation decks offers higher ground than the Twin Towers and the best views in town.